If spam has found its way into your inbox, you can simply flag it as spam. The system starts learning that similar messages are also likely spam. Please note that clicking the Spam button does not teach your specific email address what is and what is not spam. Clicking the Spam button only sends the data off to Vade so they may continue to develop their filtering system for the public as a whole. So, if a large amount of users mark an address as spam, Vade will eventually update their filters to tag that as spam for all users. Log into webmail and select the message. Click the Spam button. Alternatively, you can right-click a message and select 'Spam' from the menu that opens. The message is moved to your "Spam" folder. Occasionally, the spam filtering service may flag an incoming message as spam when it actually isn't. By flagging a message as "not spam", the service will learn to avoid flagging similar messages in the future. Log into webmail and select the message from your "Spam" folder. 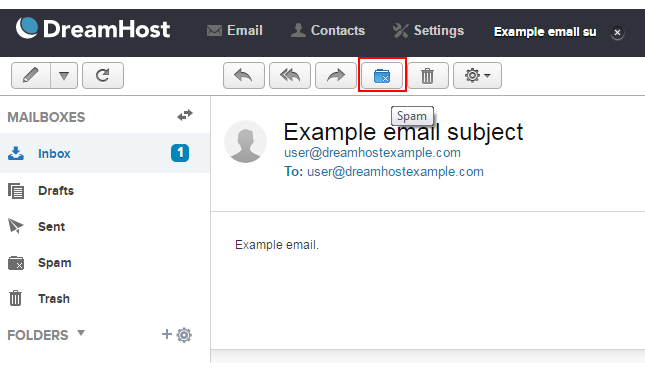 The message is moved to your inbox and reported to DreamHost's spam filtering service. Emails are quarantined in the special 'Spam' folder by default within Webmail. 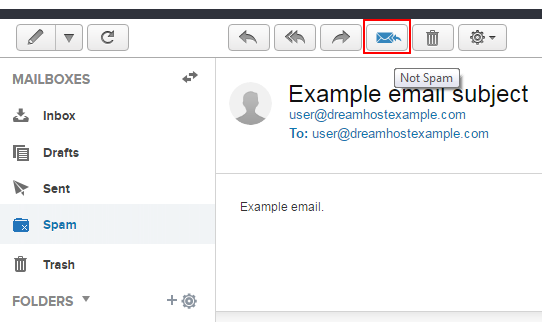 Read more about the Webmail interface in the Webmail overview article. Webmail is linked in the panel's Webmail page. Article last updated April 11, 2019 16:07 PST.